15 *Stunning* Passas That Are Perfect For Your Mehendi Ceremony! Your bridal jewellery makes all the difference to your look. And while most brides opt for traditional gold jewellery for their wedding day, it’s for the mehendi ceremony that you don’t have to stick to the norms. From quirky to colourful, you can go all out with your jewellery. And it’s also the one function where every bride should opt for a passa. After all, passas always manage to give you a royal and gorgeous look...and who doesn’t want that?! Check out these 15 stunning passas for the bride that are handpicked by us, especially for your mehendi. 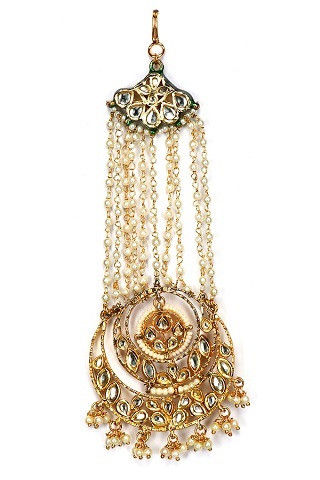 A gold-plated kundan passa with delicate chains, we love this one for the attractive round design. 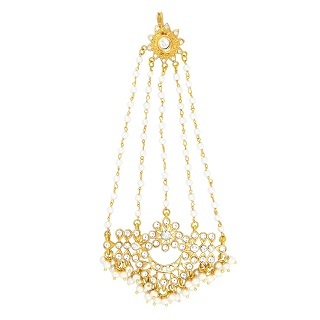 The little jhoomers that dangle at the bottom add all the style and charm to this stunning piece. Price: Rs 4,800. Buy it here. The mehendi function is all about pretty vibrant colours and this passa is just perfect for the bride who wants to add a bit of quirk to her look. 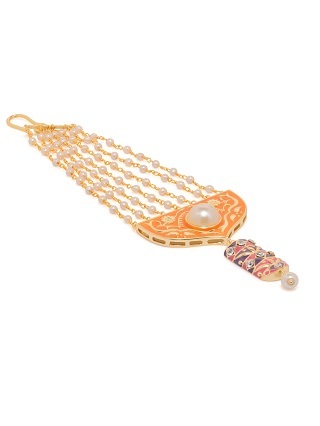 The enamel work is super pretty and the colours are sure to make you look like a million bucks! Price: Rs 1,349. Buy it here. If this isn’t elaborate then we don’t know what is! 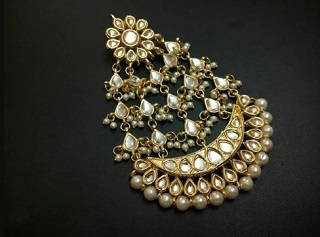 A heavily studded passa that ends with a row of pearls will complement your mehendi lehenga so well. If it’s a night function, then this is what you need to dazzle in, on the special occasion. Price: Rs 1,749. Buy it here. There’s something so beautiful about this one. 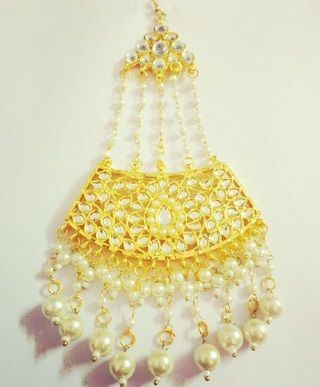 The delicate strings, the pretty pearls and the gorgeous gold tone… Everything about this one has left us mesmerized. It’s probably the only accessory you need for your mehendi function. Price: Rs 2,000. Buy it here. Get Deepika’s Bajirao Mastani look with this gorgeous looking passa. Pair it with a lehenga or an anarkali and trust us, the compliments just won’t stop coming. Add some colour to your mehendi look with this unique passa. 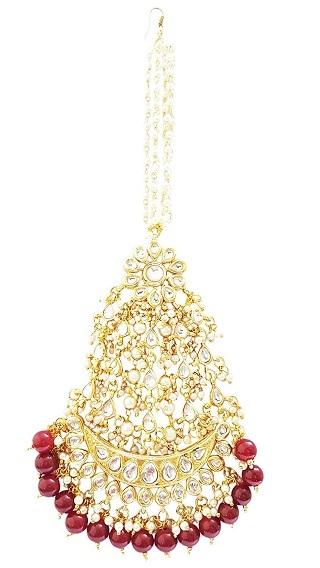 Pretty red beads, ivory pearls and a silver base make this piece an absolute stunner. We sure can’t take our eyes off it, what about you?! Price: Rs 4,875. Buy it here. 7. Look attractive in orange! Such an offbeat and fun passa! Love the blast of orange and a hint of pink and purple. For the bride who wants to go all out with the colour, this is so perfect. You could pair it with earrings in the same colour and gota bangles to match. Price: Rs 1,319. Buy it here. 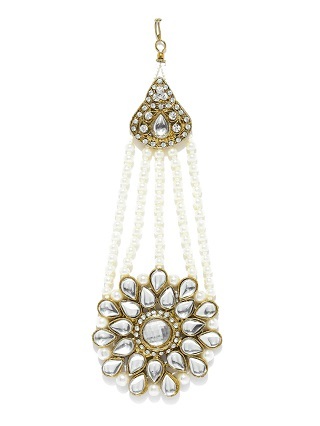 We love the chaandbali shape, the pearl drops, the delicate strings and the floral design. It’s nice and clean and just perfect for your mehendi ceremony. Tie up your hair in a tight bun and let the passa take centrestage. Price: Rs 799. Buy it here. 9. For the glam girl! White beads and crystals make such a stunning combination. And we love that statement pink stone right in the middle. 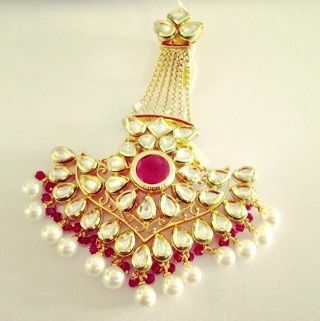 For the bride who wants to shine bright with her mehendi jewellery, this is just what she needs. Subtle and sleek, this one’s perfect for the bride who likes to keep her accessories to a minimal. We love the floral pattern and the clean design of this understated yet stylish passa. Price: Rs 600. Buy it here. Just so gorgeous! If you love big and bold jewellery, then there is no reason why you shouldn’t buy this. 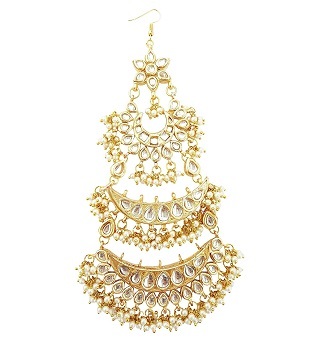 Go all out with chaandbali earrings and kundan bangles to complete your mehendi look. Price: Rs 1,050. Buy it here. 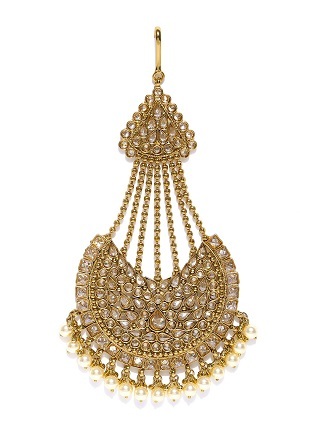 A gold-toned and kundan passa, what sets this apart are those beautiful maroon beads at the bottom. If you’re wearing a simple outfit for the function, a passa like this can totally uplift your look. 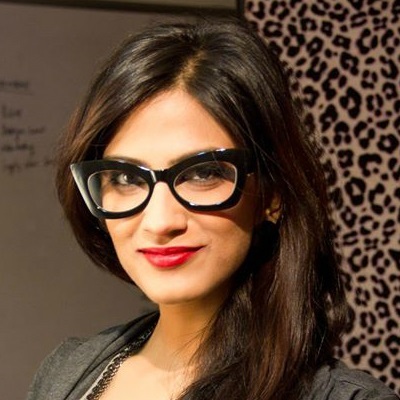 Price: Rs 990. Buy it here. Like it nice and big and fancy? 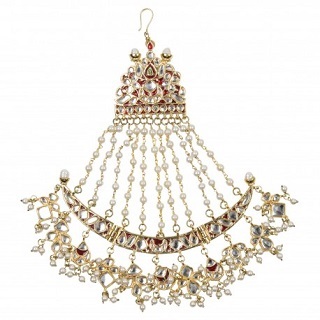 Then look no further and buy yourself this gorgeous passa that’s oh-so-stunning and very elaborate. 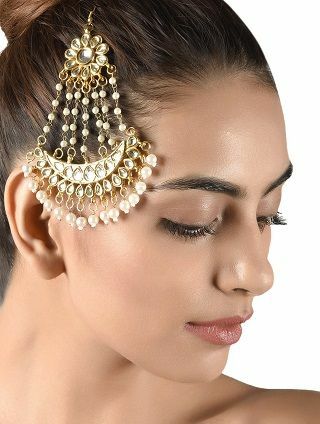 We love the triple chaand style and honestly, you need to wear it at at least one of your functions. Price: Rs 1,275. Buy it here. 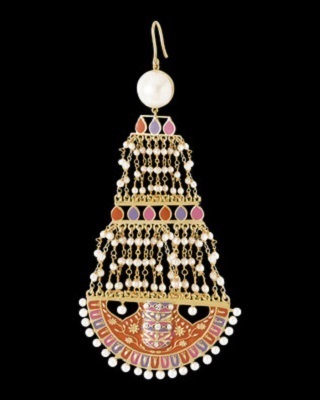 Add a colourful touch to your ensemble with this beautiful, intricate passa. 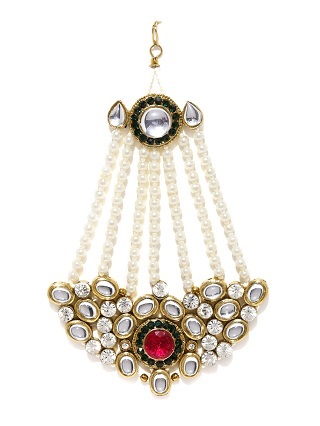 Kundan stones, enamel work and the pretty pearls totally set this piece apart. We love the design and it truly is the most stunning piece we’ve seen in a while. Wearing a green outfit? 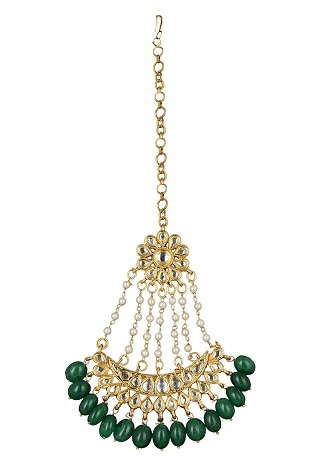 Style your outfit with this beautiful passa featuring green beads. The best part is that the green goes with most colours and it sure will add all the extra charm to your mehendi look. Price: Rs 2,370. Buy it here. So dear brides-to-be, pick your favorite passa and do share the mehendi pictures with us!